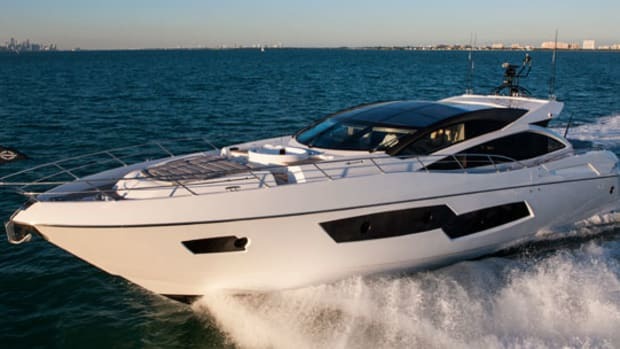 Power & Motoryacht's boat test of the Pursuit SC 365i. The new SC 365i isn’t your father’s Pursuit—and we mean that in the best way possible. 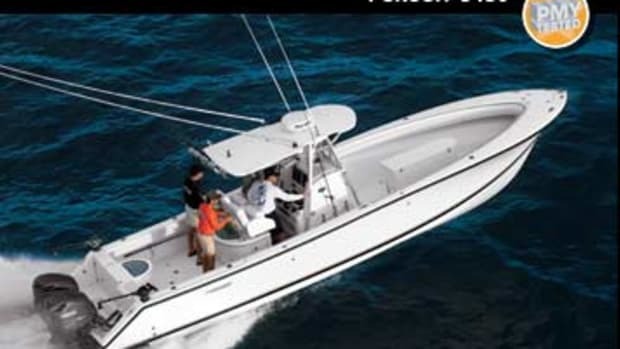 When first introduced in 1977 by S2 Yachts, they were called Pursuit Fishing Boats, and they were designed specifically to appeal to the hard-core angler. Leon Slikkers, the founder of S2, had launched the Tiara line a year earlier but, as he said, Tiara—like its royal namesake—played to the upmarket crowd. If the Tiara was a linen shirt and Panama hat, the Pursuit was a Guy Harvey T-shirt and a baseball cap. Where the Tiara was a slim glass of cool Riesling, the Pursuit was a frosty can of Bud. Not that the Pursuit was built to any lower standards, though. It just had a different raison d’etre. You’d expect to find cocktail napkins in an outside drawer on a Tiara. A Pursuit was more likely to have spools of monofilament. This wasn’t a case of “badge-engineering” as they say in Detroit, where two identical cars are cast for different markets with a change of name badges and upholstery. No, the Pursuit has always been purpose-built from the keel up for the serious fisherman. There’s always been such a distinct separation between the two brands that it’s easy to forget they are sisters. I mean, who notices that Bentleys are now made by Volkswagen? 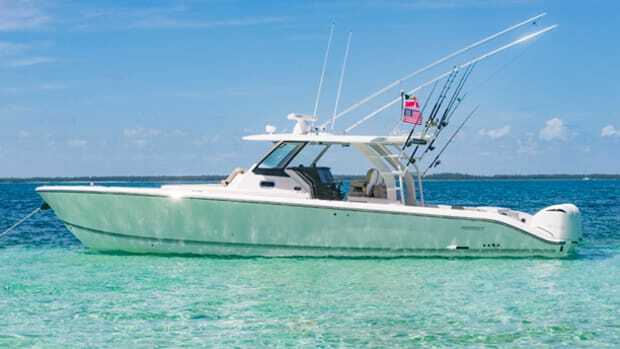 The new Pursuit SC 365i is what Tom Slikkers calls “a game changer.” The 365i still bears the DNA shared with decades of Pursuit outboard fishing boats, but it’s clear that she’s been hanging with her Tiara sisterships, too. Earlier Pursuits were single-minded fishing machines. After the weekend, you could hose out the entire boat to get rid of the beer cans and potato chips. Not with this Pursuit. This is a yacht so beautifully finished that she will appeal even to nonfishing spouses. Especially to nonfishing spouses. But that’s only part of the story. Credit for the invention of the propeller goes to Leonardo da Vinci in the 1500s, when he proposed a “helicopter” using a propeller-like device. Since then, the concept has intrigued many others. Toogood and Hays suggested Leonardo’s idea would be ideal for boat propulsion as early as 1660 while inventor James Watt, who perfected the steam engine, called it a “spiral oar” and proposed it for boats in 1784. A patent for a boat propeller was issued to Smith and Eriksson in 1836, and soon propellers were in common use on both commercial and military ships. The stern drive has a similarly checkered history. It was first used by the Italians during World War I on their MAS (Motoscafo Armato Silurante) torpedo motorboats, with huge Isotta-Fraschini engines and counter-rotating props. But the stern-drive idea lay dormant until 1948, when Mercury Marine engineer Charlie Strang mated a race-car engine to an outboard lower unit. In the 1950s Jim Wynne worked with Strang to develop the outdrive concept, but Carl Kiekhaefer, the dictatorial owner of Mercury, scorned the idea. Incensed, Wynne left Mercury and joined Volvo Penta. The company introduced the Aquamatic drive at the 1959 New York Boat Show and we were soon calling it the “inboard-outboard.” Kiekhaefer introduced the MerCruiser stern drive in 1961. But new ideas continue to arrive, and one is the Pursuit seen here, which uses a pair of hidden outboards tucked well inboard of the stern for propulsion. So, once again, we give the term “inboard-outboard” new meaning. Remember when 7-Up tried to compete with Coca-Cola by marketing itself as the un-cola? Well, this is the nautical version of that: the un-outboard. Examine the Pursuit SC 365i from any angle. Walk right up and step on the transom platform. Not an outboard in sight. Yet this is still the traditional outboard-powered Pursuit, because it has their soon-to-be-patented Integrated Outboard Technology. That’s a fancy title for the fact that they hid the outboards. Not that they were easy to hide though, because this Pursuit is powered by a pair of whacking-great 350-horsepower Yamaha outboards. 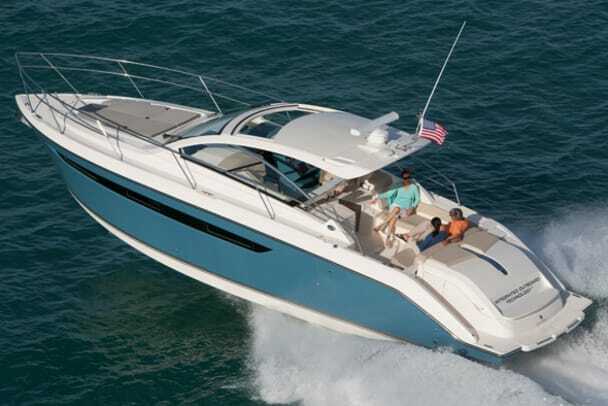 I hate to give away the ending, but the SC 365i comes so close to 45 knots that you might think about tossing your mother-in-law overboard to get a bit more speed. 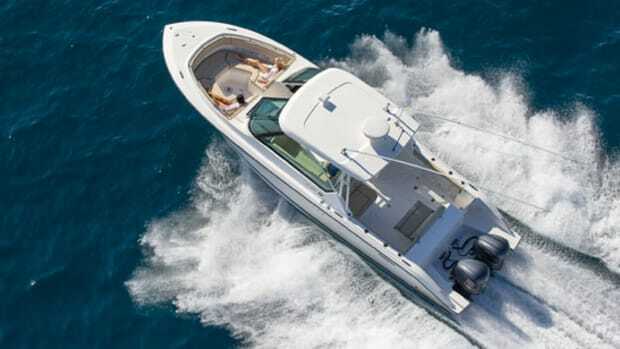 When their idea of hidden outboards first surfaced, Pursuit showed their drawings to Yamaha to get their take, and the answer was, “Go for it!” Back in the early ’90s, Pursuit was one of the first boat manufacturers to have an OEM arrangement with Yamaha to use their outboards, and that relationship was paying off. Yamaha jumped aboard this paradigm shift: the invisible outboard. First of all, let’s finish talking about the outboards. If you haven’t been paying attention, outboards have changed. They are no longer the clunky, smoky, noisy machines of yesteryear. These Yamaha 350s are pure sophistication: 60-degree V-8 big blocks with 32 valves (four per cylinder) and dual overhead cams like you’d find in everything from Ferraris to the LT5 Corvette. People who moved away from outboards can now return without fear. The way that Pursuit hid these clamp-ons is very well done. A clamshell hatch lifts to reveal the big powerheads, and there’s even a little door in the side so you can step right in to pop off the covers and work on them. Your service guys are going to love you, because everything is right there, the engines can be tilted up easily, and there’s no balancing act hanging over the stern. Speaking of the stern, that’s another benefit of this design. 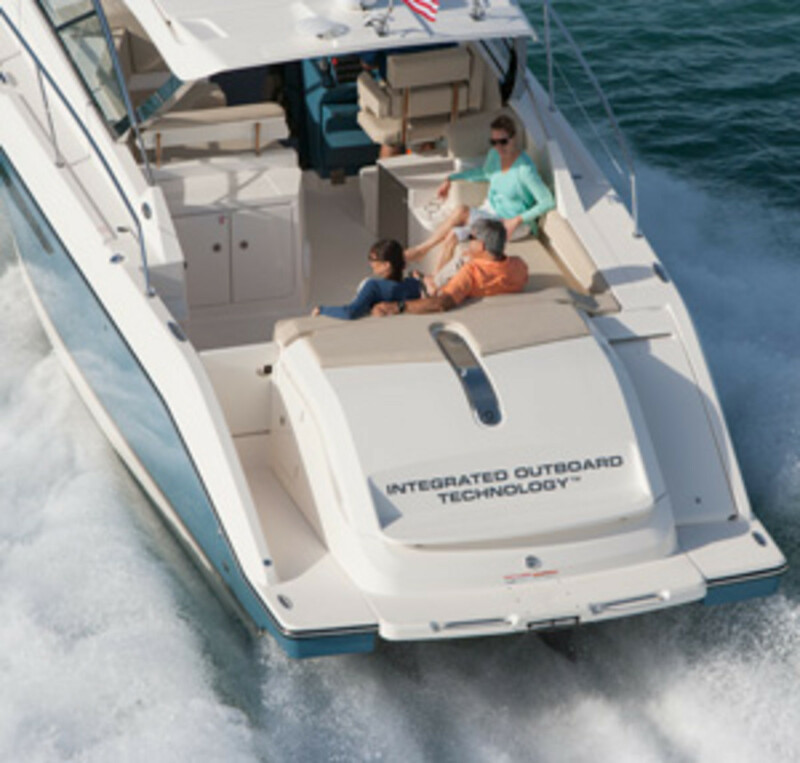 Let’s face it: outboards mess up the transom. There’s no way to walk around the back of the boat, and even getting into the water is a matter of climbing over and around engines. Not with this design. Guests can step aboard the swim platform from the dock, walk across the transom, and enter the single-level cockpit through a civilized gate. Once in the cockpit, this won’t be any Pursuit you’ll recognize from past iterations. This one is comfy-luxe. 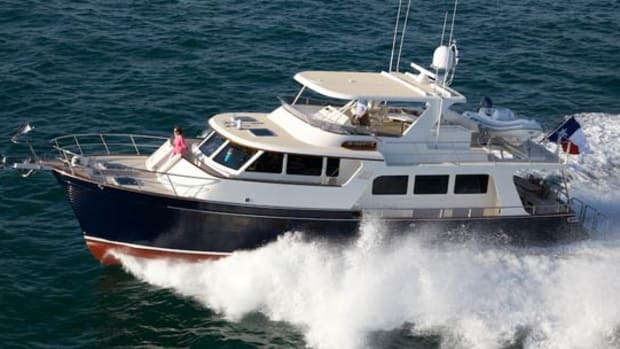 A big settee wraps around from the engine cover to just behind the helm seat, and there’s a built-in console with a sink and Kenyon grill that make the area an outdoor galley. A fridge is under the helm seat nearby. But that’s only part of the cockpit. Just forward is a wraparound settee that places guests behind the protection of the windshield and under the integrated fiberglass hardtop with a standard sunroof that opens smoothly on rollers. It’s a place to keep the skipper company, although there’s already a doublewide helm seat for that purpose. The helm? It’s a nice one, molded in cadet blue with room for a Raymarine e125 HybridTouch multifunction display just above the stainless steel wheel. Rocker switches are neatly arrayed in three rows, the Yamaha electronic shifter is just where your hand falls naturally, and there is a very clever fold-down footrest that doubles to raise the sole for when people of lesser stature are standing behind the wheel. A word about the windshield. It’s one piece of curved and tempered glass that nestles into a composite receiver so you’ll never face corroded aluminum frames again. The sightlines give the skipper the same “big-screen” view that is on that huge flatscreen TV at home. But, to be picky, the flat dashboard area below the windshield needs to be a dark color, because all that great windshield is ruined with white reflections. Step below, and you really know you’ve left PursuitLand and entered TiaraTurf. This cool and contemporary cabin is yacht-like in its styling and finish, with pale anigre joinery and a wash of natural light from ports and skylights. The galley fills the port side, with a two-burner Kenyon cooktop, an under-counter convection oven, and a big Isotherm fridge. There’s ample counter space, as well as overhead lockers and drawers in the console for stowing your utensils and Cheerios. The head is opposite and, once again, yacht-like with its Euro-styled glass sink and an oversized shower compartment separated by a linen closet. Forward is another clever Pursuit touch: a vee-shaped dinette with a gorgeous wood table that fills the tapering forward area of the cabin to create a comfortable dining area. But that’s only during the day. At night, this area has all the surprises of those Transformer movies: the table lowers, the settees unfold on innovative slider/supports, and the area morphs into a comfortable island double berth. But, for anyone who has struggled to convert a recalcitrant dinette table into a night berth, this isn’t it. We’re talking push here, poke there, and nighty-night. But lest you think, well, that’s it for sleeping quarters, you missed the doorway next to the galley that leads into a full-beam amidships cabin with a queen-size berth that can be split into a pair of singles if desired. This cabin has a settee, hanging locker, and full headroom (in parts). If you didn’t notice it as you strolled through the cockpit, stop and lift the hatch in the sole. Underneath, you’ll find Pursuit has moved the traditional lazarette forward and created a useful compartment. In the old days, they would have called this the “electrical flat.” Drop into the compartment, which has a full floor above the bilge, and you’ve not only got immense stowage but many of the ancillary systems for easy access. On our test boat, the compartment easily handled an 8-kilowatt Panda generator, a Charles IsoBoost transformer for shore power, and battery chargers for both the engine and house batteries. 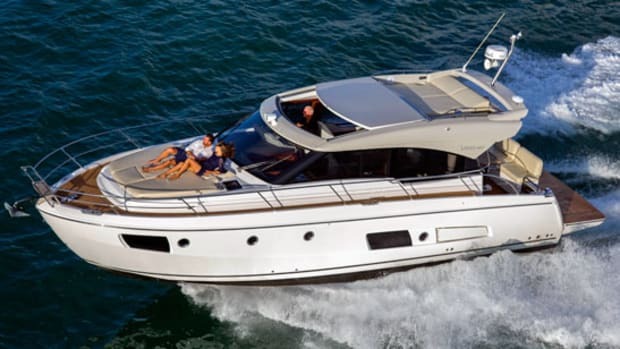 Pursuit innovation didn’t stop with the cockpit or the cabin, and the foredeck is worth a browse as well. For one thing, the SC 365i has a through-the-stem anchor and windlass system that cleans up the area and provides a tidy nest for the Delta plow anchor that doesn’t require a roller atop the bow. The downside is that, if you aren’t a plow-anchor aficionado, a Danforth- or Fortress-style fluke anchor or a Bruce-style claw just won’t fit. 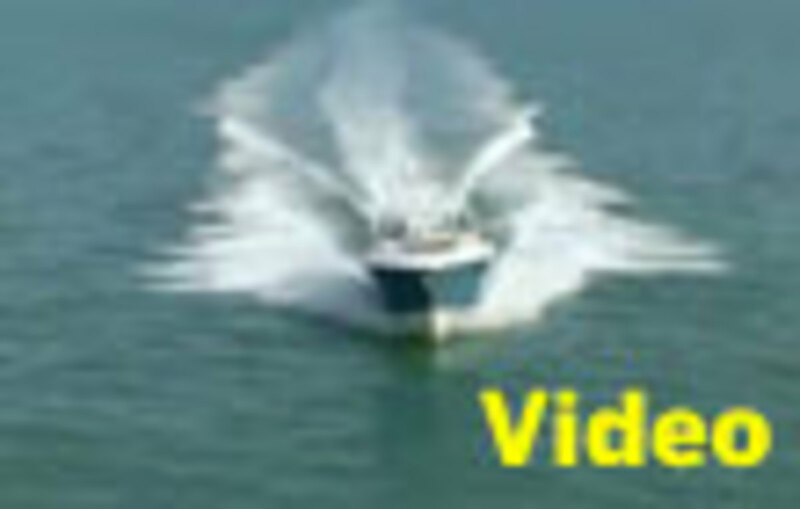 The horizontal windlass has both a handheld and a switch at the helm for remote operation. Finishing off the foredeck is a recessed area that accepts an optional sunpad with self-adjusting backrests. Pursuit gets points for solid double rails from the cockpit to the bow, as well as sturdy handholds throughout the cockpit and cabin. Even poking into out-of-the-way nooks, the construction was up to Pursuit’s high standards, with vinylester resin in the hull for blister protection and a resin-infused system of structural grids and stringers that tie into the outboard transom for strength. 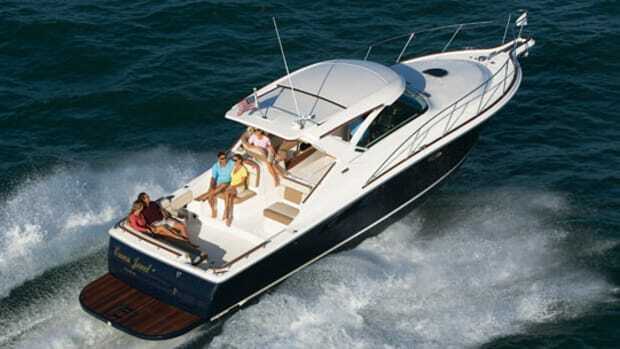 Hull and deck have five-year structural and blister-free warranties. 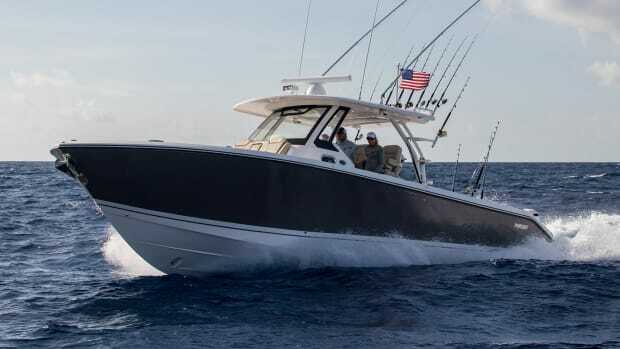 Underway, the SC 365i was quick and nimble, with the big outboards getting a solid bite from a pair of four-bladed stainless steel Yamaha SDS Saltwater props. 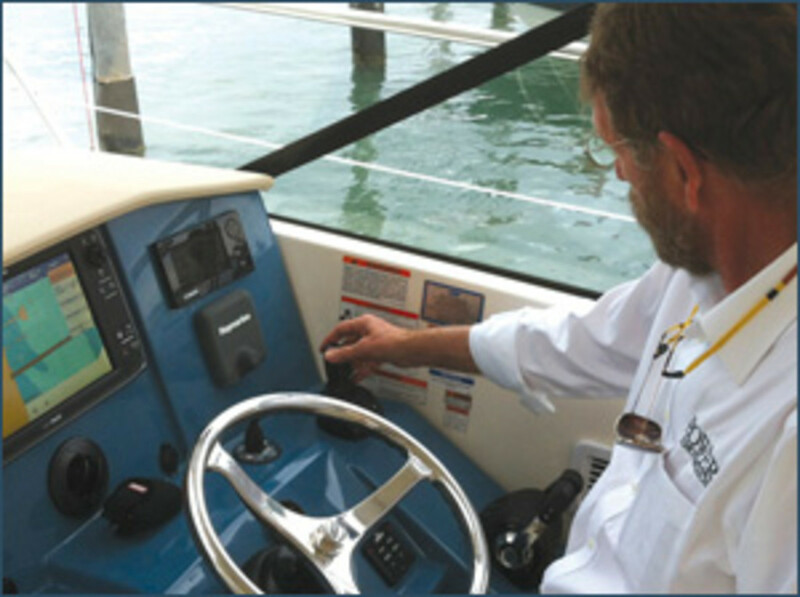 Dual Teleflex hydraulic steering cylinders give fingertip steering, and a Type 316L stainless steel tiebar handles the torque of the counter-rotating propellers. At full throttle, the SC 365i tops out at just over 41 knots, but she’ll loaf along all day at 4000 rpm, staying on plane at 22 knots and getting about .8 nmpg. 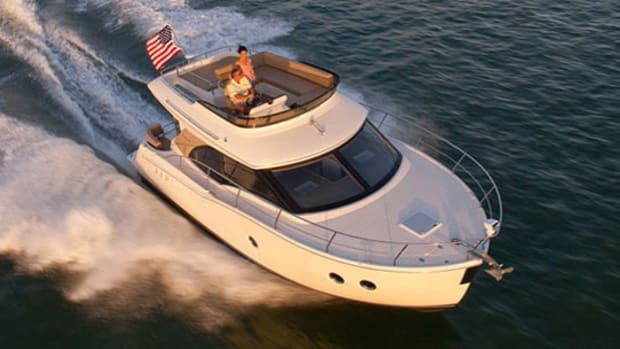 The standard equipment list is surprisingly complete, including the Lewmar bow thruster and Lenco trim tabs, a full entertainment system that includes an iPad and Apple TV, air conditioning, and generator. So again, this isn’t your Dad’s Pursuit, and that’s said with affection. But if you’re looking for a rough-and-ready fishing machine, you might want to move on. 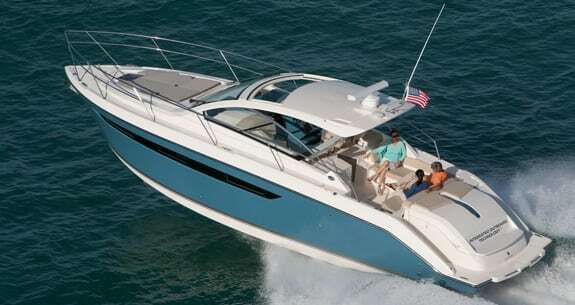 This is an innovative and very likable yacht that should carry you and your family on grand adventures. I was impressed, and I think you will be, too. Just don’t call her an inboard-outboard. 260 gal. fuel, 75 gal. water, 3 persons; 50 lb. gear.